Ten To Zero: New alternative to back surgery. The Vertos MILD procedure is a minimally invasive alternative to surgery. 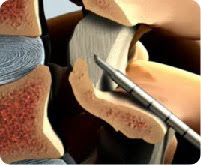 The procedure is done completely through a needle sheath and under x-ray guidance. The company has released data from its ongoing FDA trial. So far, 67 percent of study participants had a successful outcome based on pain relief and improved function. In addition, to date, patients have shown clinically significant improved function from baseline per the study guidelines set by the U.S. Food and Drug Administration panel on orthopedic and rehabilitation devices. Study leaders have also noted that the data confirmed mild’s safety profile, with no dural tears, blood transfusions or other procedure or device-related complications having occurred. Dr. Webb is the only physician in the Tulsa area trained to provide this minimally invasive alternative to invasive spine surgery.